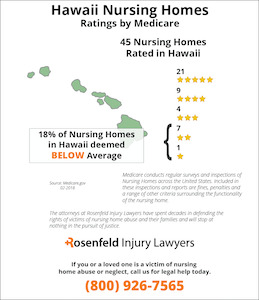 Nursing home negligence in Hawaii has become a widespread problem. Nursing home abuse and neglect can cause residents to receive serious injuries and in the worst cases, death. Statistics indicate that residents were harmed in over 17 percent of facilities in Hawaii. Further, 42 percent of facilities were discovered to have unsanitary food that was unsafe for nursing home residents. Over 33 percent of all facilities in Hawaii were also discovered to have an accident-prone environment. Over 11 percent of all facilities had patients who also developed pressure sores as a result of neglect. 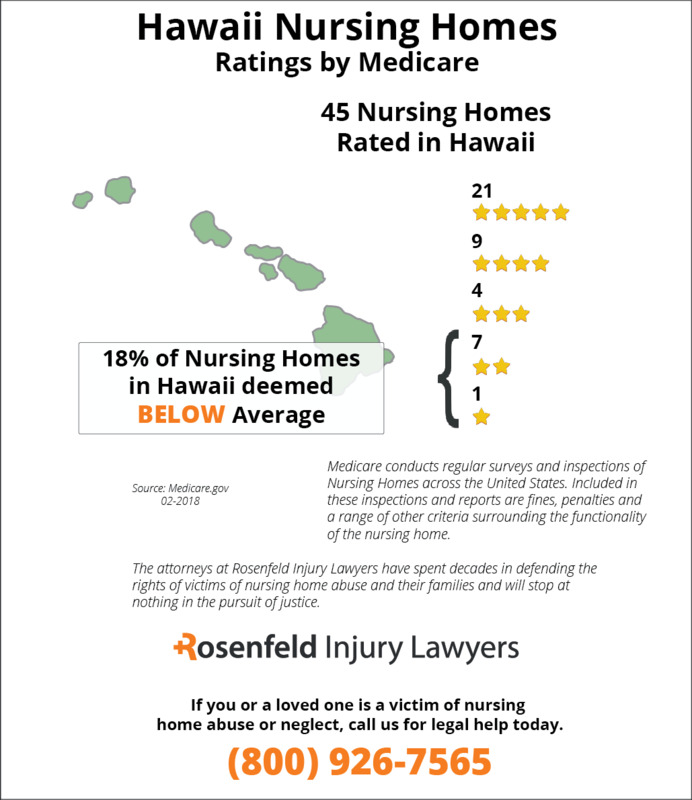 According to information collected by Medicare, eight (18%) of the 45 nursing homes in Hawaii are deemed to be below average because the facilities provide substandard care due to identified serious deficiencies and violations. This publicly available information was identified through surveys, inspections and investigations filed by family members, friends and concerned employees. 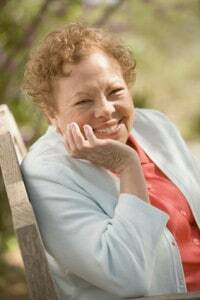 If your loved one was neglected, abused, mistreated, or died prematurely while residing in a Hawaii nursing home, we invite you to contact the Hawaii nursing home abuse & neglect lawyers at Nursing Home Law Center (800) 926-7565) to discuss your case for compensation during a free claim evaluation. Nursing home injury lawyers are available to help family members who have had loved ones suffer injuries as a result of deficiencies in nursing homes. Those who have injured loved ones can get in touch with Hawaii nursing home lawyers to receive immediate legal assistance with their claims. Hawaii laws seek to provide the maximum protection possible to vulnerable residents in nursing homes. The civil penalties for dependent elder abuse are codified in §28 to §94 of the Hawaii Code. This section indicates that a caregiver who is liable for abuse will face a civil penalty of $500 to $1,000 for each day in which the abuse occurred. Caregivers must also cover the costs of investigation into the abuse incidents. A lawsuit based on nursing home negligence in Hawaii must be brought within two years of the original date of discovering a loved one’s injuries. In addition, there is a $375,000 cap on non-economic damages for loved ones who suffer injuries, except for mental anguish and other types of damages. When any of these forms of abuse have occurred, the attorney general has the power to bring a civil action on behalf of the State and against a caregiver who commits abuse. If nursing home workers recognize any signs of this abuse that are affecting a resident, they have a legal duty to report the abuse to the appropriate authority. Nursing home workers are liable if they know of abuse that is affecting a resident and fail to report the abuse. Family members should also report any signs of abuse to authorities as soon as they become aware of its impact on a loved one. It is important for family members and nursing home residents to know all of their legal rights. The legal rights of nursing home residents are clearly listed in the Nursing Home Reform Act of 1987. Under the Act, residents are provided rights such as the right to be free of abuse or exploitation, receive treatment with dignity, be free of physical or chemical restraints, have privacy, communicate freely and be free of neglect. If a resident is placed in immediate jeopardy for a violation of one of these rights under federal law, then the enforcement process will begin. If there have been repeated patterns of abuse in a nursing home, then severe sanctions may be available to hold a nursing home accountable for this abuse. Available sanctions include monetary penalties, revised training of staff, new management, termination of provider agreement, denial of Medicare or Medicaid payments, denial of Medicare or Medicaid admissions and more. Get in touch with Hawaii nursing home lawyers to receive the assistance that you need to succeed in making a claim and protecting your loved one from abuse. Nursing homes in Hawaii have a legal obligation to their patients to protect their safety and well-being. Most disabled and elderly residents in nursing facilities are sickly and require constant care from qualified medical staff. Many families entrust nursing facilities to provide the quality care to their loved one. They expect the home to give them the kindness, dignity and respect they deserve. Unfortunately, many patients are mistreated or neglected. Statistics maintained by the American Health Care Association (AHCA) show that more than 50 percent of all citizens will be a resident in a nursing facility at some point in their life. They will require the medical staff to assist them with their personal hygiene, basic needs, and medical requirements to maintain a quality of health. 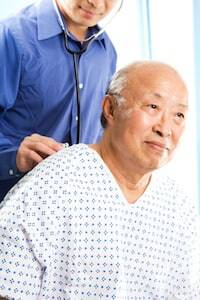 However, according to the CDC (Centers for Disease Control and Prevention), more than 10 percent of all patients residing in nursing homes today suffer from bedsores, which are nearly always preventable. Bedsores are common occurrence in nursing homes because they easily develop without proper monitoring by competent staff. A bedsore (pressure sore; pressure ulcer; decubitus ulcer) develops when constant pressure is applied the skin over an extended time. In just a few hours, the pressure on the skin can limit blood flow and oxygen causing permanent damage or death to the surrounding tissue. If left untreated, the pressure sore can begin to ulcerate, causing an open wound susceptible to life-threatening infections of the blood and bone. Successful nursing facilities develop and implement protocols to ensure the patient’s skin integrity. Patients admitted to the home usually go under a thorough evaluation. The medical staff conducts an assessment to determine the baseline of the patient’s skin integrity, and notes any detected existing pressure ulcer. When a bedsore is identified, the doctor directs the medical staff to use proven protocol to effectively treat the sore. In nearly every case of early-stage bedsores, the wounds can heal easily. Unfortunately, neglect is a common occurrence in nursing facilities in Hawaii. When a bedsore is acquired in the nursing home, it is typically an indicator of neglect or mistreatment. Numerous factors contribute to abuse and neglect cases reported in the state. In many incidences, the nurses and nursing aides in the facility perform their duties under stressful situations and are often overworked and underpaid. They are often poorly trained, which can lead to unintentional or intentional mistreatment of the residents. Ensure that patients are consuming a nutritious diet and remain hydrated. Take every step to ensure that patients remain clean and dry to avoid contact with moisture from their own sweat, feces and urine. Turn or reposition wheelchair-bound and bedridden patients every two hours to alleviate the pressure on bony prominences including their hipbones, ankles, heels, shoulders, sacrum, buttocks and head. In many incidences, the nursing home administration does not contact family members when a loved one is suffering a bedsore. Because of that, it is essential to be proactive to ensure your loved one is receiving routine skin integrity assessments. Using every available medical and legal tool, these professionals can protect the most vulnerable patient. Contact a reputable Hawaii bed sore lawyer listed below to provide your loved one an advocate dedicated to stopping the abuse and mistreatment today.